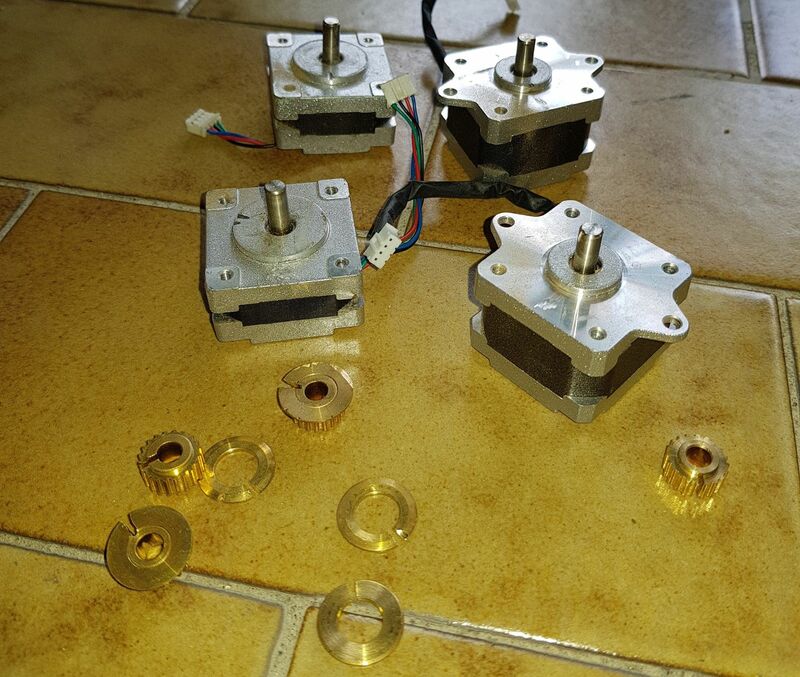 Removing Pinion Gear From Stepper Motor : .sha VS pinion | Life, The Universe and ... Everything! 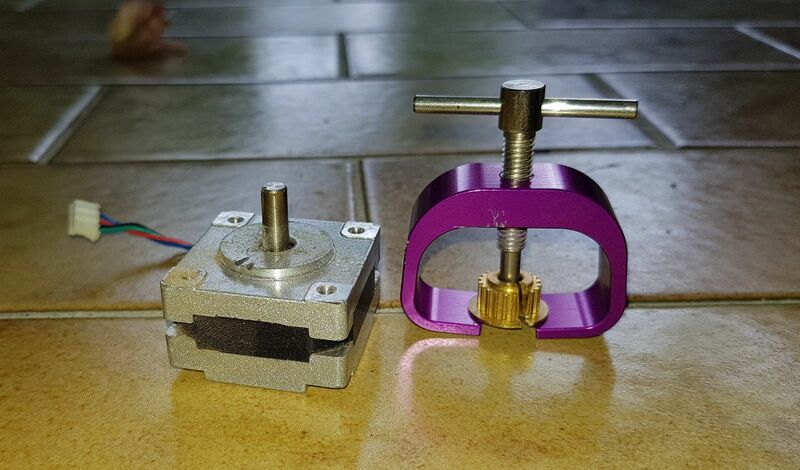 Back in September I tested using a 12V 28BYJ48 Stepper Motor to move the throttle levers on my 737 Throttle Quadrant. It worked, but I believed it was at the limits of the motor's torque capabilities. If you look back at the video, you'll notice the motor jumps a bit when crossing the 45 degree point probably due to the sudden shift in weight. My gut instinct told me that I should upgrade the motor now before proceeding with the rest of the design. The motor size is the biggest (literally) hurdle as there is limited space inside the Throttle Quadrant Body. The next category up from the 28BYJ48 types are the NEMA14 motors. NEMA14 is the standard for the face of the motor and how it mounts. 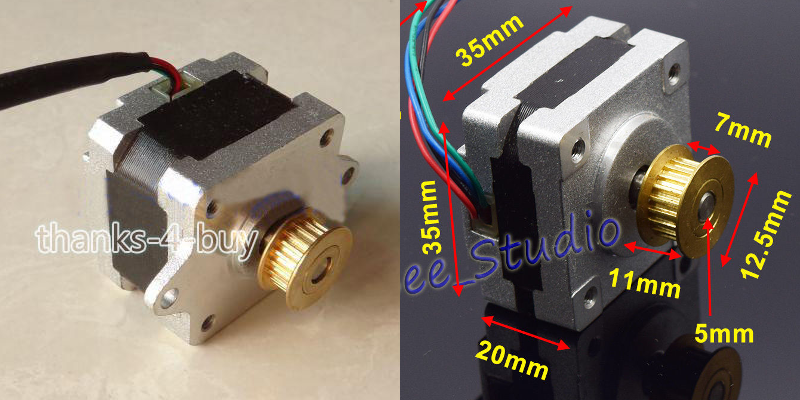 They used to be used on 3D printers to control the movement of the extruder and carriage, though most printers these days now use the NEMA17 standard. The standard doesn't specify the torque of the motor, although generally the larger the motor, the stronger it is. I picked two NEMA14 sizes on eBay, one 20mm, and the other 27mm in depth, to try out. It took the usual 2-3 weeks to arrive. However, when I opened the package, I realized both models had a pinion gear already mounted on the shaft. These are used to drive the belts on 3D Printers. I tried to remove them ... and failed. They don't come off so easily. There was no grub screw, so it appears these pinion gears were press fitted on. Hmmm... Let's do some research. 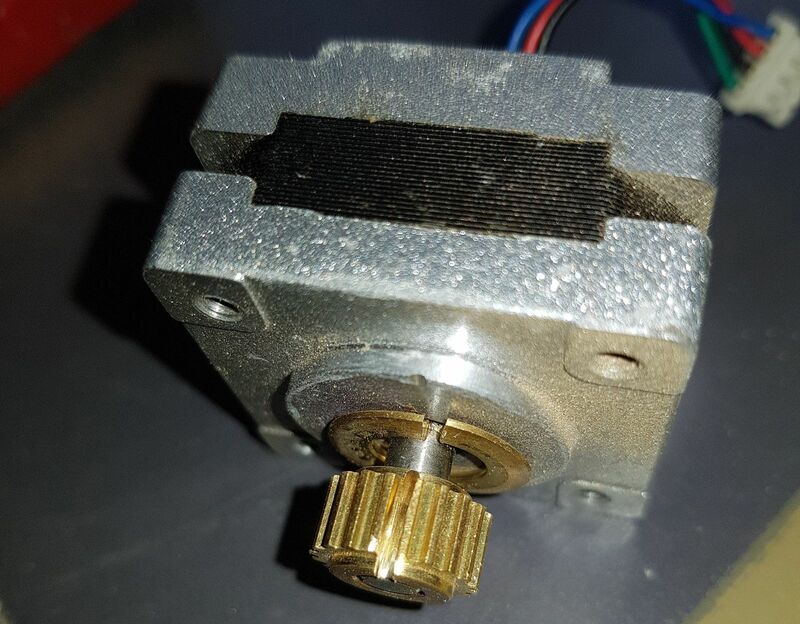 The first thing to read is that you should not use a flat screwdriver as a lever between the pinion gear and the motor body and pry it off -- you will end up with a bent shaft. You need a plate to hold and support the pinion gear, then hammer a nail down onto the shaft, which causes the pinion gear to separate form the shaft. I built a bracket using part of a L-bracket (it was 3mm thick). 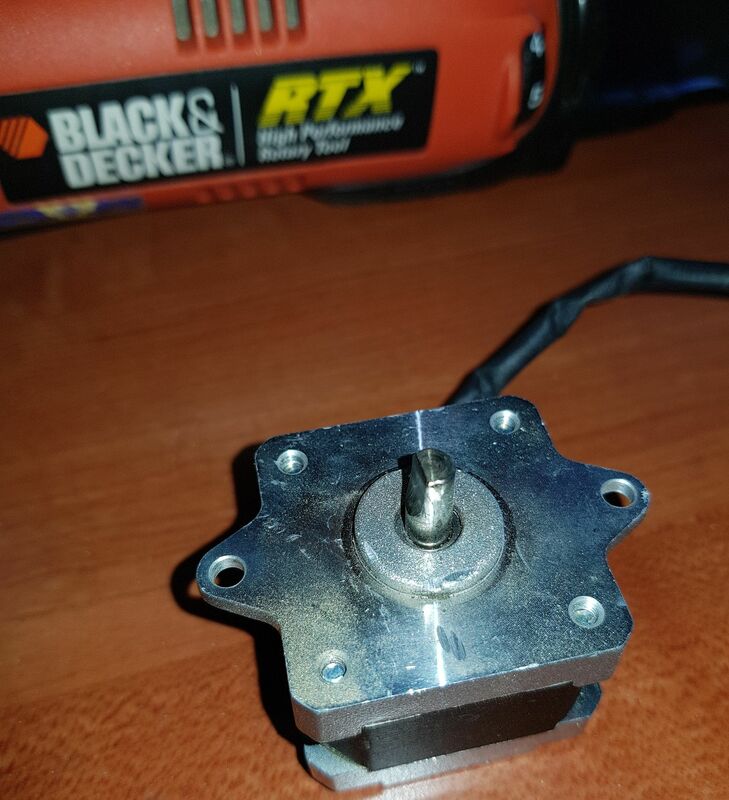 I used my Black and Decker RTX tool to cut a channel to let the motor shaft go through. Whacked it with a hammer ... no luck. This is similar in principal to the first method. You support the bracket on the drill press, and mount a drill bit backwards in the chuck. The drill bit is then lowered and pushes down onto the shaft. A drill press has some gearing on it's lever which means you can create a stronger pressure on the drill bit than you can manually. I did this (yes I have a drill press!) ... and ended up with a bent bracket! Fail. Since the pinion gear is made of brass it should heat up faster than the shaft, which means it would expand sooner and therefore loosen its grip on the shaft. So I tried applying heat from solder station set to 400 degrees centigrade. I heated up the pinion gear for over a minute. I didn't want the shaft to get too hot too -- not only will tighten the grip but it may also heat up the insides of the motor and damage it. No difference. I've seen videos of people using a butane torch ... do I have to get one of those next? The metal here looks thick and strong. This design came with specific models depending on the gear shaft size. I ordered the 5mm unit. Unfortunately being a "hobby" thing it was quite pricey ... USD15 + 6 shipping. I figured I didn't have much choice, and hoped it might be useful again someday, and so proceeded to order it. It took just under two weeks to arrive. By now I was getting quite fed up with the whole situation. I fitted the pinion gear into the slot, and turned the handle ... turn ... turn ... turn ... turn ... urgh ... it won't turn any more. Fail. Went to bed fed up. I figured I could get some leverage using a long spanner to turn the handle. I used a second spanner to grip body of the tool. Turn ... Turn ... Turn ... Turn ... hmm ... no pinion gear wasn't budging at all, but the metal frame of the tool was starting to bend! $*($#(% Fail!!! It's been over a month since I started on this problem ... it ends today, one way or another! It's time to bring out the RTX Rotary Tool! It's time to go all out, and if this doesn't work I will order a new set of steppers explicitly without pinion gears, and figure out some form of suitable vengeful destruction for the set I've already got. It was a weekend so I went over to my parents house (can't do noisy work on weekends as I live in an apartment). Working in the patio next to the garden, I fixed the motor to a vice, and fixed the vice to a piece of wood for stability. I brought along my desk magnifier so I could have a close-up view of what I was working on. Also despite already wearing safety glasses, I figured it would act as another layer of protection between the work and my face. Given how tight it the pinion gear was, I fully expected it to go flying off like a rocket. I had a 70% used cut-off disc on my Black and Decker RTX rotary tool. It's always difficult to decide to use it or start with a new one ... the more used the disc is, the more likely it is to shatter and go flying off at very high speeds in all directions. But the small size would also make it easier to cut into the pinion gear, especially near towards the motor plate. So i went with that. It turns out it is quite easy to cut through the pinion gear material -- brass is after all a lot softer than steel. In fact you will know once you've cut down the the level of the shaft as only then will sparks start to fly, as the cut off disc reaches the hard steel. I managed to cut through all but the very base of the pinion gear -- as I moved it closer the cut off disc would touch the motor's plate. At this point I stopped ... and tried to pull the Pinion Gear off with pliers -- it still would not budge! Once I'd gotten the hang of it with the first one, the other three motors were quite easy. As a follow up act, I also decided to grind part of the shaft to make it into a "D" shaft. 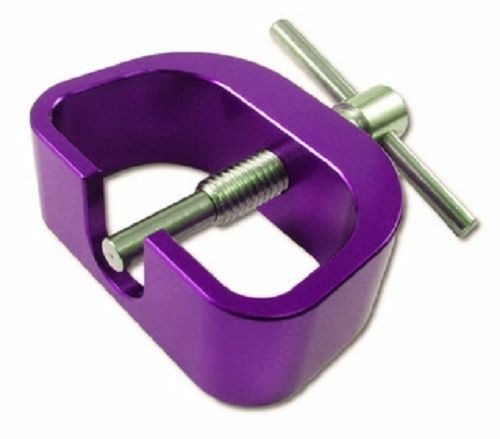 This is so that I can mount my gears without them slipping on the circular shaft. 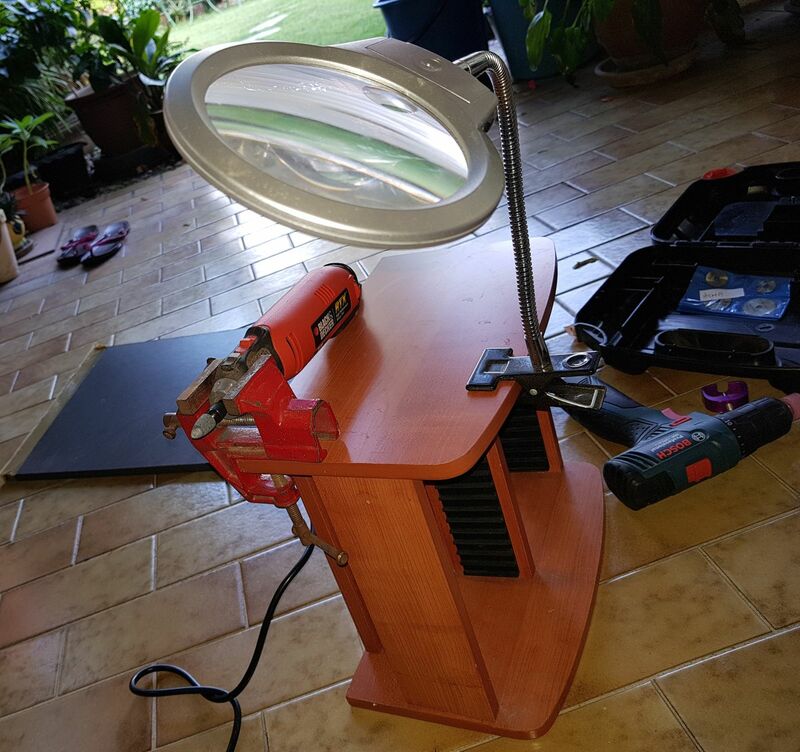 I found an old CD holder which i used as a base, and clamped my Black and Decker RTX to it. 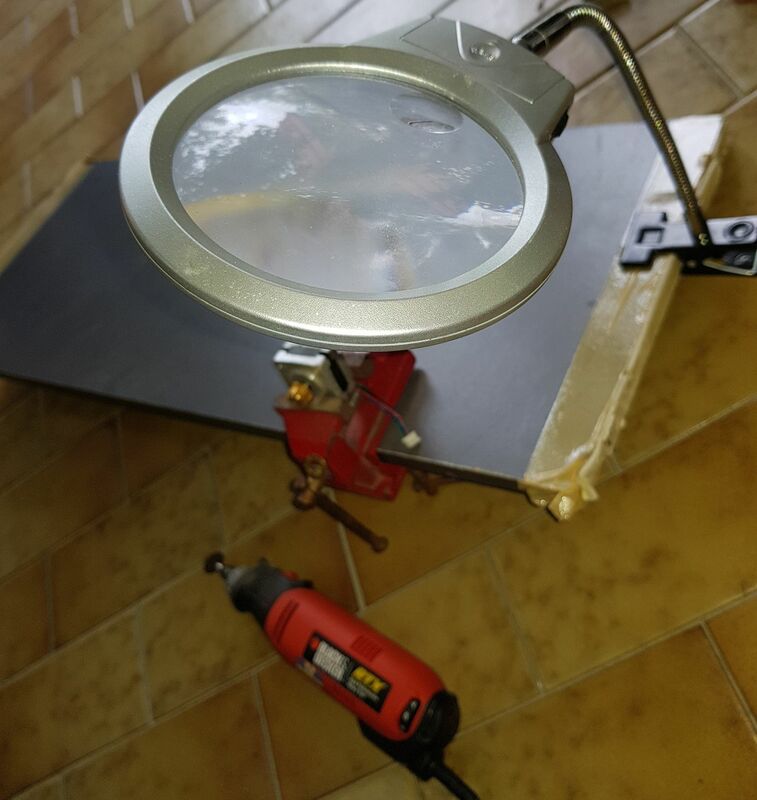 I had bought a set of grinding stones years ago, and it was finally time to make use of them. Unfortunately, the shaft on the cylindrical shaped ones were too big to fit into the RTX, so I had to make do with a cone shaped one (The bigger one fits on my drill, but my drill didn't spin fast enough nor was there an easy way to keep it on all the time). It was a bit hard to reach the bottom end of the shaft with the conical stone ... but I did manage to cut a "D" shape into it. It should be enough to hold a 3D printed gear or a shaft-mount with set screw. I might finish up using a metal file. I guess now I can finally get back to work on the 737 Throttle Quadrant.